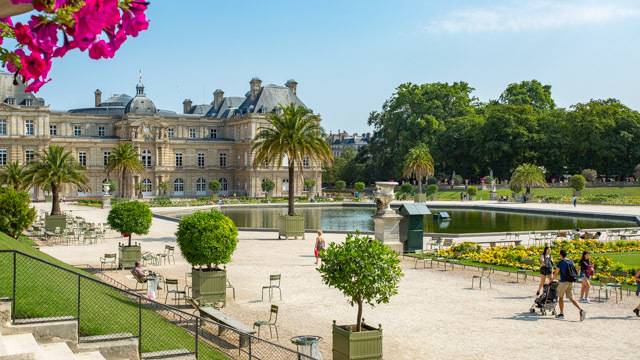 The Jardin du Luxembourg, also known in English as the Luxembourg Gardens, is located in the 6th arrondissement of Paris, France. 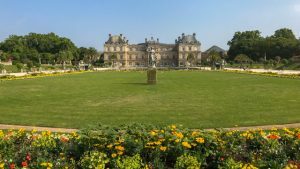 It was created beginning in 1612 by Marie de‘ Medici, the widow of King Henry IV of France, for a new residence she constructed, the Luxembourg Palace. The garden today is owned by the French Senate, which meets in the Palace. It covers 23 hectares and is known for its lawns, tree-lined promenades, flowerbeds, model sailboats on its circular basin, and picturesque Medici Fountain, built in 1620. The garden is largely devoted to a green parterre of gravel and lawn populated with statues and centred on a large octagonal basin of water, with a central jet of water; in it children sail model boats. The garden is famed for its calm atmosphere. Surrounding the bassin on the raised balustraded terraces are a series of statues of former French queens, saints and copies after the Antique. In the southwest corner, there is an orchard of apple and pear trees and the théâtre des marionnettes (puppet theatre). The gardens include a large fenced-in playground for young children and their parents and a vintage carousel. In addition, free musical performances are presented in a gazebo on the grounds and there is a small cafe restaurant nearby, under the trees, with both indoor and outdoor seating from which many people enjoy the music over a glass of wine. The orangerie displays art, photography and sculptures.